Taking cue from the realm of game console development, AMD has announced a new game development model called ‘Mantle’ at the GPU14 Tech Day event in Hawaii. 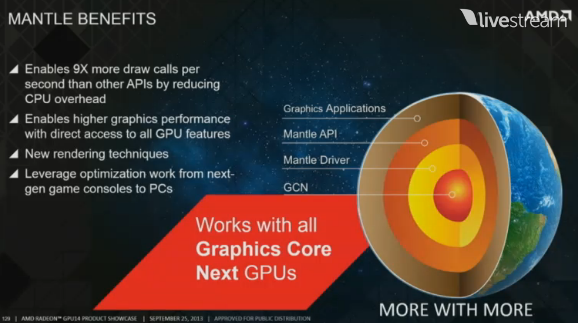 Using a collaboration of both API specifications and GPU drivers, Mantle will provide developers the platform to extract a higher degree of utilization from the existing GCN architecture as well as the GCN 2.0 architecture of the new Radeon series, via low-level high-performance drivers. Battlefield 4 will be the first title to make use of Mantle, although it will not be available at the time of the game’s launch. The technology will be implemented through a free update in December. 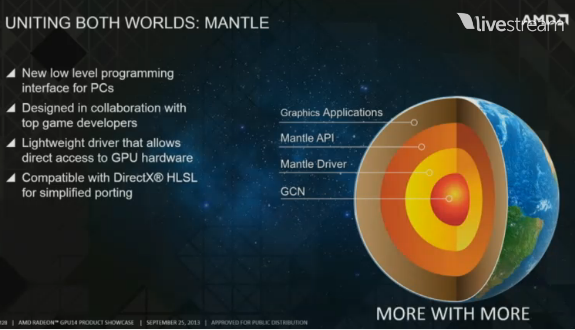 Mantle offers more control of the GPU and CPU to game developers, allowing games to extract the maximum potential of AMD GPUs. The concept behind this model is similar to what is found on console game development, where developers have a significant amount of control over the hardware. With both next-gen game consoles featuring AMD’s GCN based graphics, it should give great incentive to developers of multiplatform titles to use Mantle as a the development model of choice. What does this mean for Nvidia, though? Only time will tell. Stay tuned for more on AMD’s new game development model as well as its new lineup of GPUs.